Team Tinkoff-Saxo has said it is "very serious" about its proposals to have the world's best four riders compete in the three Grand Tours for a €1m prize. Chris Froome, Vincenzo Nibali and Nairo Quintana have been challenged to take on Tinkoff's fellow Grand Tour winner Alberto Contador in the Giro d'Italia, Tour de France and Vuelta a Espana. Team chief executive Stefano Feltrin said: "This isn't a publicity stunt. The fact our team owner Oleg Tinkov is putting on the table a financial incentive is proof of our intentions." The £789,329 prize fund could be divided between the riders taking on all three races, or go to the man who does best across all of the three-week races. "We first approached the other teams during the recent Vuelta and we are encouraged by the recent positive reaction to our idea," added Feltrin. The route for the 2015 Giro d'Italia, revealed on Monday, raised the possibility of the quartet competing against each other before launching rival general classifications campaigns in the Tour de France a little over a month later. The Vuelta is raced in August and September. The 2015 Tour de France route will be unveiled on Wednesday, 22 October with the Vuelta route to be published next year. Team Sky principal Sir Dave Brailsford, whom Tinkov targeted with a Twitter message reiterating the challenge, said a series of high-profile clashes would fuel interest in the sport, even if it may prove difficult for the riders involved. Tinkov-Saxo's team manager Bjarne Riis said: "I think there is a very small number of riders that are able to accomplish such a remarkable feat and we still don't know who they might be, because it hasn't been done before. That's the beauty of this challenge." Nibali and Contador are two of six men to have won all three Grand Tours during their career but no rider has won all three in one season. It is unusual for riders, particularly those looking to win the title, to compete in all three races in the same year. Only 32 men have completed all three races in the same year since the Vuelta was added to the roster in 1935, while just three men have ever won a stage on each Tour in the same year. Australia's Adam Hansen has completed all three races in each of the last three years, finishing outside the top 50 on each occasion, although he is not a Grand Tour contender. Spain's Carlos Sastre, who won the 2008 Tour, is the only Grand Tour winner to recently complete all three races in a year, finishing eighth in the 2010 Giro, 20th in the Tour and eighth in the Vuelta. 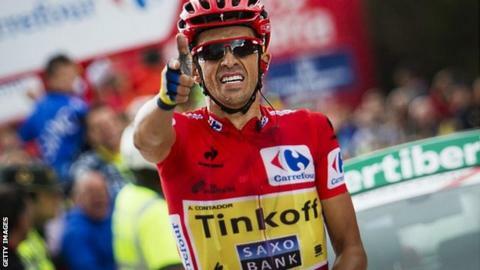 Contador won his third Vuelta title in September, to take his overall tally to six, while Astana's Nibali completed the set by winning the Tour. Movistar rider Quintana picked up his first Grand Tour victory in the 2014 Giro, while Team Sky rider Froome became the second British Grand Tour winner when he won the 2013 Tour de France. Froome finished runner-up at the Tour to Sir Bradley Wiggins the year before and has twice been runner-up in the Vuelta. Nine men have won either the Giro and Tour, Tour and Vuelta, or Giro and Vuelta in the same year. Contador was the last to win two races in one year when he won the Giro and Vuelta in 2008, while Italian Marco Pantani won the Giro and Tour in 1998 and France's Bernard Hinault did the Tour and Vuelta double in 1978.